Following the sudden appearance of last week’s mysterious Assassin’s Creed logo, another image for Assassin’s Creed: Rising Phoenix has been discovered by All Games Beta, along with some fresh evidence that suggests it is an unannounced PlayStation Vita title. While the first Assassin’s Creed: Rising Phoenix image contained little more than a logo set against the inside of a large warehouse, this new piece of potential concept art reveals a few more details. 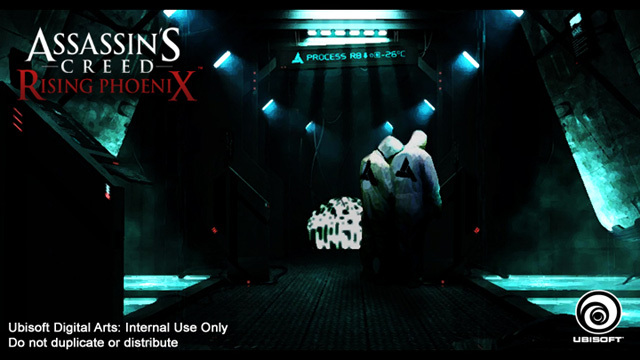 The scene depicted in the new image appears to show two workers (possibly of the scientist variety) wearing white hooded-jumpsuits, that have a design similar to the Abstergo Entertainment logo printed on the back. Both workers are standing on a walkway, surrounded by large vats of light blue liquid, and they are looking down at one of several consoles. The Vita angle attached to this new Assassin’s Creed: Rising Phoenix image comes from a screenshot from the Spanish online retailer XtraLife, which shows a listing for the unannounced title. According to the image, the game will launch on October 10th for the PlayStation Vita. A search of the retailer’s website does not reveal the listing, which means it was removed or the screenshot is a fake. Backing up the retailer listing is an unconfirmed VGleaks report from late last month, which stated that Ubisoft is planning to release a second Assassin’s Creed title alongside Black Flag later this year. That rumor didn’t give a name to the title, but did mention the possibility that it is for the PlayStation Vita. This second AC game was not announced during the Assassin’s Creed IV reveal, and other than the XtraLife listing, we have not heard any other rumors pointing to the existence of such a title. Check out the new Assassin’s Creed: Rising Phoenix image above, and let us know in the comments if you think it is the real deal or a fake.